Sorry I cannot be more help, there shouldn't be a problem getting a refund. Thanks for your advice. I will ask my producer. My own laptop as you know does not support a version of FCX that is new enough to work with X2Pro so that option is closed. My producer stopped working on this film 2 years ago so I'm not sure she will even have the same laptop... I may still - after all this - need to get a refund for X2Pro and get someone else (My producer or my sound guy) to buy it with my money in order to get these files out. Thank you for your help and have a good Christmas. Ah, I think that fundamentally that is the problem, if you cannot access media that the XML is pointing too then the application will never be able to. Essentially the XML is pointing to media using paths that are valid on another physical machine but not the one you are using. 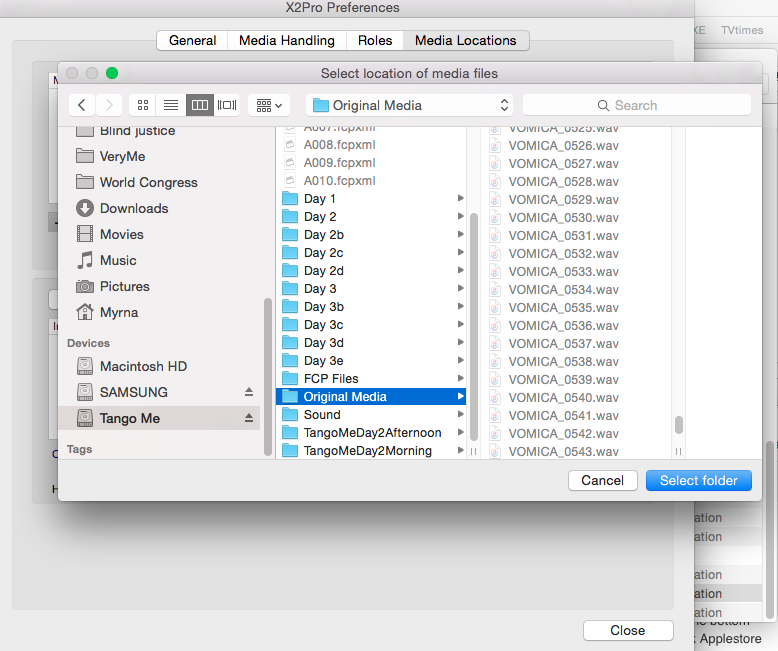 Fundamentally we are looking at FCP creating an XML that points to the media, so either you run X2Pro on your producers laptop or create a new XML on your machine that points to where the media is actually located from the perspective of your machine. Can you run X2Pro on your Producers laptop as this would appear to be the easiest option ? 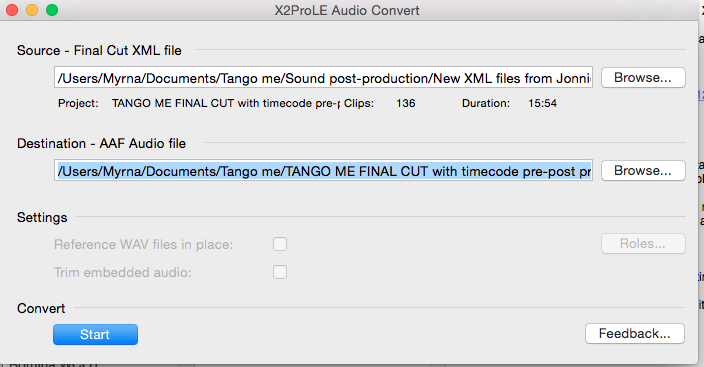 I cannot access individual files from the library /Tango_Me_WORKING_EDIT.fcpbundle (And therefore the file Tango Me Raw 2/Original Media/ within it). This library was created on another laptop by my producer when she synched sound to image before giving me the library to edit (I'm the director). I think this library may be one of the roots of the problems. It also won't let itself be selected as a high-level folder as Daniel had suggested in an earlier post. I do have other backup hard drives with the raw files that I can select individually (This is where I sent you the Vomica_0407 from). Also, you need to know that one of the hard drives was configured for Windows and not Applemac which may be another source of problems, although I sent you the Vomica file from the hard drive that is AppleMAc and has raw files. When I tried force converting to AAF, I got 8 pages of missing media and 1 of retimes clips. We cannot find anything wrong with the clip and can add it to your sequence and process it here, however the clip supplied was VOMICA_0407.wav and not VOMICA_0407 (fcp1).wav. If not then that is why we cannot read it. If the clip VOMICA_0407.wav is in this location then I have edited your xml (attached) so you can process it your end. 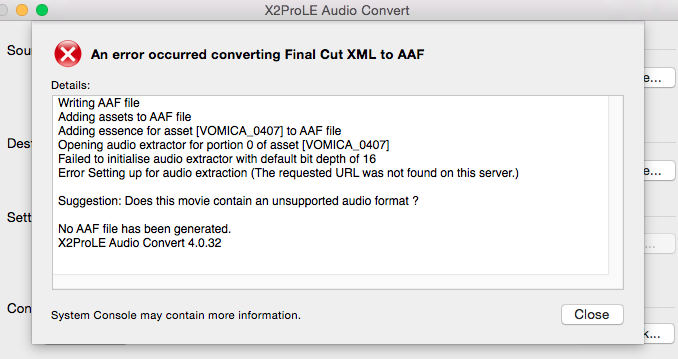 When you process the XML in the LE version of X2Pro you can forcibly create an AAF even if the media is not available, this will create an AAF that might not be complete but it will create a sidecar .txt file that will detail what clips could / could not be found and what effects are not processed (i.e. retiming) and where they are in the timeline. To do this load the XML in X2Pro and hold the shift key down whilst you press the start button. Would you be able to make this clip available to us as we believe there is something odd about it, so you are aware we try to extract the audio from it using AVFoundation and if that fails we fall back to using QT, it appears both methods are failing. I will pop you a separate mail with the ftp details on. If you need the AAF created then there are a couple of workarounds, the first is to allow X2Pro to create an AAF even if it errors reading some media, (x2pro preferences/media handling/handling media errors), it will skip or leave this media out of the resultant AAF. 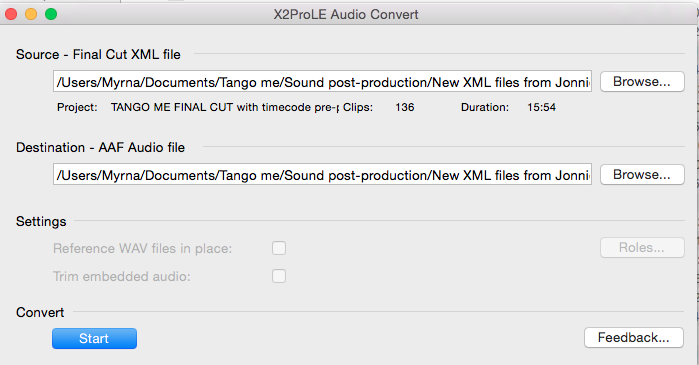 The other option I can think is to push the clip through something like Apples Compressor and create it in different audio format and then use this instead of the original clip in the xml (this is a bit fiddly). Thanks for trying one last time. I am aware that you tried to help me but I can't seem to be understood so far. Here's what I've done once again. Added my xml file (Please remember, issued from another laptop in order to make it an xml version compatible with your software) in your top window. All OK so far. Set the destination for the AAF as the same folder. Went to Media locations to sandbox the media files. Added my media files. As they didn't drop to your bottom window, I had to click verify against XML which brings me a menu where I can't select the files. This time, I read the instruction to verify the xml itself which I did and you'll be glad to know, I've finally for the first time received the error message you have been needing. I've documented all my steps in screenshots so you will see the error message in there as well as send my original xml file. If this last attempt does not work, I will get a refund for your software then I might ask my sound guy to buy it on his own computer so he can try himself. If he also struggles, then I will give up and have to find an alternative to finally get my AAF file out. Sorry to hear you are not very happy I believe we have been trying to help, you are perfectly entitled to ask the App Store for a refund and I am sure they will oblige. However I don't believe we have actually seen the error with processing your XML. Can you please attempt to create the AAF, and if you fail to create an AAF can you provide the error text (will be created wherever you determined the AAF should be) and a copy of the XML itself. I'll try explaining one final time as you don't seem to provide phone or live support. 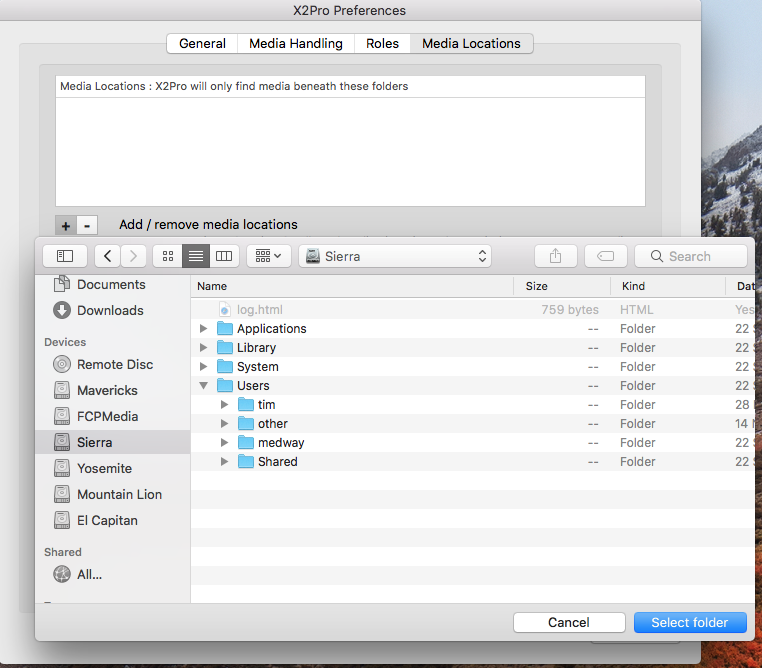 When I select my locations in the media locations folder in the top box, it asks me to verify against FCX XML, opens a new window to locate the files. It doesn't then let me select my media files which is why I never manage to get any file in the bottom folder. I'm unavailable now until Monday but will pick up your answer then. If we don't solve this, I will give up and ask Applestore for a refund and try another way of converting my files. Can we speak on the phone or online please? The message you are referring to isn't an error message for the locations you have selected. The message "Inaccessible Locations: X2Pro cannot read media from these locations" refers to the bottom box which would display any locations X2Pro doesn't have access to. Since yours is empty, there isn't any locations X2Pro still requires access to. I hope this has explained what you are seeing. This is exactly what X2Pro does not let me do. When I select the whole hard drive or when I try and select just the library or just the overarching file where the media is, it comes up with the same message (See previous screenshots): Inaccessible locations:X2Pro cannot read media from these folders. We're back to square one. What do you suggest now? Apologies for not being very clear, what I meant by a higher folder was the folder that all your original individual files are stored in. Alternatively, to save you having to keep adding new media locations whenever you work on different project you can just select the hard drive its self as a Media Location. Simply select the hard drive, and then at the bottom right click "select folder" and it will allow X2Pro access to any media in that location. I don't understand your response but if by 'dropping', you mean adding my xml file to the source box in your software, then yes, I did that (See attached screenshot). 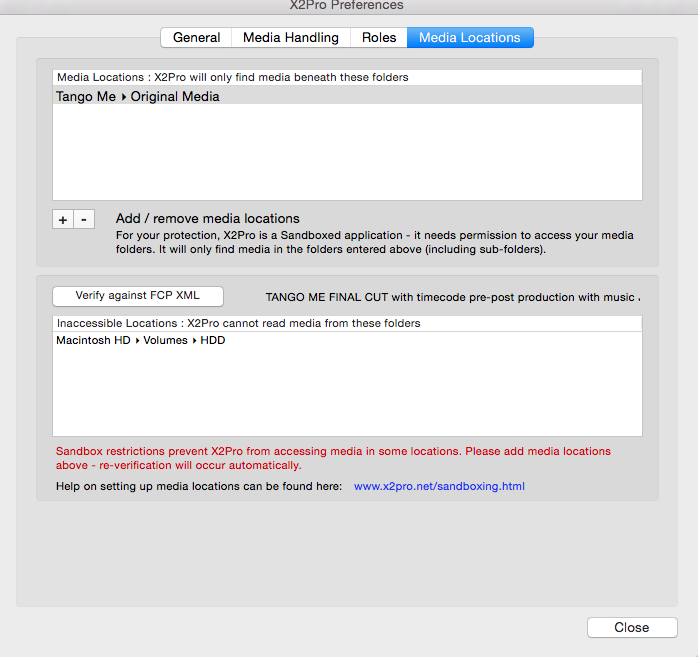 As to 'When setting the Media locations you don't need to select each individual media file. 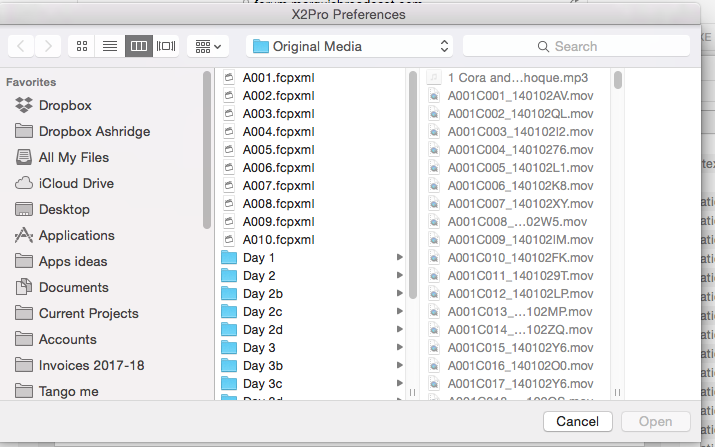 As long as you have given X2Pro access to a higher folder it is able to locate all of the media files it needs', that is why I sent you my screenshots. It won't let me add either my higher folder (The library bundle) or the individual files (the alternative media files) into your file locations.